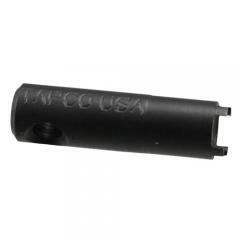 Keep your rifle shooting true with the help of the AR15/M16 Front Sight Tool from Tapco. The convenient handheld unit is designed to allow users to make quick precision adjustments to A2 style front sights. The tool is forged from machined steel and features a black oxide coating that protects it from the damages of elemental exposure. This means shooters can carry this tool in their packs or pockets into the field without worry of corrosion or rust. For added convenience, the tool includes a lanyard hole so that it can be secured with a tie-down to prevent loss. It is also specifically sized to work in conjunction with Tapco sights and Intrafuse systems and fits in SAW pistol grip storage compartments. The item is well made and not a piece of junk that will deform or brake upon use. I'm very pleased with the service I received from CopsPlus and will continue to purchase quality equipment and accessories.